What is the efficacy of ventricular shunting for iNPH (therapeutic question)? Are there reliable clinical or laboratory predictors of a successful outcome of shunting (prognostic question) (efficacy and successful outcome both defined as a persistent, objectively demonstrable, and clinically meaningful improvement after shunting)? In November 2010, the American Academy of Neurology (AAN) Guideline Development, Dissemination, and Implementation Subcommittee (appendices e-1 and e-2 on the Neurology® Web site at Neurology.org) formed a panel of experts to develop this guideline according to the processes outlined in the 2004 AAN process manual, with 2 exceptions: we used the 2011 AAN process manual in our approach to developing conclusions and used the therapeutic classification of evidence scheme subsequently updated from the 2011 AAN process manual.6,7 We performed an initial search of MEDLINE, EMBASE, LILACS, and the Cochrane Database from 1980 to September 2012, limited to English-language publications, using the search terms (“normal pressure hydrocephalus” or “NPH” or “adult hydrocephalus syndrome” or “hydrocephalus”) and (“shunting” or “treatment”) and (“trial” or “outcome” or “predictors” or “response”) and “neurosurgery.” The search identified 438 citations. We performed an updated search of MEDLINE and Cochrane from 2012 to November 2013 using (“normal pressure hydrocephalus” or “NPH”) and filtering manually with terms of initial search. Subsequent to this update, 2 additional relevant studies were published and are included. We excluded case reports, editorials, meta-analyses, review articles, duplicative reports, and articles regarding only secondary NPH, including fewer than 10 patients with iNPH or suspected iNPH (as smaller numbers would lack statistical power), using no comparison group, or following patients for response to therapy for less than 3 months. At least 2 reviewers working independently of each other screened each of the remaining abstracts for relevance. If discordant conclusions could not be resolved by consensus, we included a third reviewer. Two panelists reviewed in detail the articles considered relevant to either of the questions, using pre-established criteria for relevance. This selection process yielded a total of 36 articles. Each article was classified according to the AAN's classification schemes for therapeutic (2011) and prognostic (2004) articles (see appendix e-3).6,7 Table e-1 presents studies rated above Class IV (with one exception). Many included studies lacked generalizability because patients, while representing a typical clinical spectrum, were preselected for surgery on the basis of tests other than the ones being studied. In these studies, we upgraded or downgraded certain therapeutic and prognostic conclusions using the formal AAN-modified GRADE (Grading of Recommendations Assessment, Development and Evaluation) methodology (see tables e-2 and e-3).6,8 We linked recommendations directly to the evidence (see appendix e-4). There were 3 Class I, 8 Class II, and 7 Class III studies relevant to the prognostic question. Three Class III studies were identified for the therapeutic question. All remaining articles had Class IV evidence. What is the efficacy of ventricular shunting for iNPH? A second prospective, nonrandomized trial with Class III evidence9 evaluated 33 patients with suspected iNPH as determined by clinical symptoms, ventriculomegaly, and ventricular stasis on a radionuclide CSF flow study (injection of radioisotope into the lumbar subarachnoid space with serial imaging tracking ventricular entry and washout). All were offered shunt surgery, and 19 underwent surgery. Of the remainder, 4 were on a waiting list for surgery, and 10 declined surgery. These 14 controls were comparable with the patients who had the operation. Outcomes were assessed 3 to 4 months after surgery by an independent observer using the Clinician Interview-Based Impression of Change, plus carer interview (CIBIC-Plus), which assesses change in global ratings as well as cognitive, balance and gait, and urinary functioning.10 Among shunted patients, median CIBIC-Plus rating was 2 (moderate improvement) vs 6 (moderately worse) in controls (p < 0.001 for global ratings, Kruskal-Wallis test). On global ratings, 14 of 18 shunted patients showed marked or moderate improvement, one showed minimal worsening, and none demonstrated marked or moderate worsening, whereas 9 of 14 controls showed marked or moderate worsening (p = 0.03, Fisher exact test; relative risk 0.35, 95% CI 0.13–0.83). On gait measures, 89% of shunted patients showed moderate to marked improvement, a finding not occurring in controls. A third prospective, randomized, nonblinded study11 using the modified Rankin Scale as an objective outcome measure (Class III) evaluated 93 patients with suspected iNPH, at least 1 of the 3 clinical elements of the triad, and ventriculomegaly on imaging. Patients were randomized to undergo lumboperitoneal shunting within 1 month or 3 months of randomization. In the intention-to-treat analysis, 32 of 49 patients in the immediate group and 2 of 44 in the delayed group improved ≥1 point on the modified Rankin Scale, assessed 3 months after randomization (difference 61% [95% CI 42%–68%], p < 0.0001). Shunting is possibly effective in patients with iNPH, with a 96% chance of subjective improvement and an 83% chance of improvement on the timed walk test at 6 months (3 Class III studies). The risk of serious adverse events (AEs) was 11%. We upgraded the strength of evidence from very low to low because of the strong subjective effect of shunting, with 95% reporting subjective improvement in symptoms, compared with only 19% of controls. Among objective measures, only gait improved significantly. Are there reliable clinical or laboratory predictors of successful outcome of shunting? CSF dynamics and infusion tests. In addition to the clinical response to CSF removal, studies have investigated CSF dynamics. CSF flow is pulsatile—pressure fluctuates with arterial pressure and with B waves; the latter slow rhythmic oscillations in intracranial pressure (ICP) with periods of 30 to 120 seconds.14 A study of CSF drainage (Class IV for incorporation bias) and CSF dynamics (Class II)15 in 51 patients with iNPH found no relationship between B-wave amplitude or frequency and shunt response. Two small studies (1 Class I14 and 1 Class II16) did not show differences in B waves relating to shunt response, but they were underpowered to detect differences and are not considered further. In patients with suspected iNPH, those with elevated Ro are probably more likely to respond to shunting than those without elevated Ro (1 Class I study and multiple consistent Class II studies), but lower Ro does not preclude shunt responsiveness. One study,22 Class II for the effect of demographics on shunt response, observed that in patients responding to external lumbar drainage (ELD), shunt response was independent of age (not an element in the comorbidity index [CMI]) up to the ninth decade. A Class III study (previously discussed)21 created a CMI tabulating medical diagnoses (table 2). Of 64 patients with iNPH, those with scores ≤3 had better responses (p = 0.003). Overall, 66% of patients with iNPH had a good response, but 83% of those with low CMI had a good response. Age is possibly not an independent risk factor for poor shunt response (1 Class II study). In patients with suspected iNPH, there is insufficient evidence to determine whether those with 3 or more major comorbidities are likely to respond less favorably to shunting than those with fewer comorbidities (1 Class III study). In one study (Class III for spectrum bias),23 19 patients with iNPH underwent prolonged ELD against a medium resistance valve followed by shunting. Improvement with ELD predicted shunt response. When gait was measured, 16 of 19 who improved with ELD improved with shunting; 1 of 3 who did not improve with ELD still improved with shunting. A Class I study17 (previously discussed) of 142 patients with iNPH, in whom TTs were performed preoperatively but whose results were concealed until final blinded outcome analysis (limited generalizability because of restricted spectrum of patients), found no correlation between results of the TT and outcome. However, this study found that in this population, preselected on the basis of clinical and imaging criteria, positive predictive value of the TT was 88% but negative predictive value only 18%, resulting in an overall accuracy of 53%. In patients with suspected iNPH, there is insufficient high-quality evidence to conclude that improvement in response to ELD predicts response to shunting. Patients who improve after TTs may be more likely to respond to shunting, but negative TTs do not preclude a response to shunting. Cerebral blood flow and acetazolamide reactivity by Tc scan. One Class I study of 162 patients (with limited generalizability because patients were selected for surgery on the basis of a TT and CT cisternography with iodinated contrast)24 found that SPECT cerebral blood flow (CBF) in responders was no different from CBF in controls or nonresponders. The study also found that CBF reactivity to acetazolamide was significantly impaired in responders compared with controls (p < 0.0025) and nonresponders (p < 0.005). In patients with suspected iNPH, those with impaired CBF reactivity to acetazolamide are possibly more likely to respond to shunting than those without impaired CBF reactivity to acetazolamide (1 Class I study downgraded because of imprecision and lack of directness). One Class II study and 3 Class III studies addressed MRI aqueductal CSF flow. In the Class II study,25 49 patients with suspected NPH were selected on the basis of clinical picture and brain imaging, supplemented with findings following a large-volume LP in 36. Shunting was followed by improved gait in 86%, improved continence in 69%, and improved cognitive function in 44%. Elevated aqueductal flow rate did not predict the response of any aspect of function, although all patients with rates >33 mL/min did improve. CSF flow rates in the 5 patients who did not improve clinically after a TT were higher than in the patients who did improve after LP. One Class III study26 reviewed 35 patients with suspected NPH. ICP was measured with an extradural monitor, and patients were stratified as follows: ICP >12 mm Hg (active hydrocephalus, n = 15), ICP <12 mm Hg but with abnormal pressure waves (compensated hydrocephalus, n = 18), and ICP <12 mm Hg with no abnormal waves (brain atrophy, n = 2). Aqueductal flow was compared with that in a group of 27 healthy volunteers and expressed as flow velocity; values greater than approximately 10 mm/s were considered elevated. Of 33 patients with active or compensated hydrocephalus, 29 had elevated velocities; 28 of these patients improved with shunting. Of the 4 with normal aqueductal velocity, 3 improved with shunting. Another Class III study27 included 61 patients with suspected NPH (41 ultimately with iNPH) who underwent TTs, CSF-ITs, and MRI and were selected for shunting on the basis of clinical picture, brain imaging, and Ro ≥13 on CSF-IT. Using a cutoff flow rate of 24 mL/min (lower than in the Class II study and not directly comparable to the velocity measure in the other Class III study26), MRI sensitivity was 46%, and specificity was 95% for iNPH. A third study28 reviewed 38 patients with suspected NPH, stratifying aqueductal CSF stroke volume as low (≤50 μL), medium (51–100 μL), and high (≥101 μL). There was no relationship between this measure and shunt response. Patients with suspected iNPH who have high-velocity aqueductal flow on MRI scan and an abnormal CSF-IT are possibly more likely to respond to shunting (1 Class II study and 2 Class III studies). In patients with suspected iNPH, there is insufficient evidence to determine whether those with moderate to severe neuropathologic findings of AD are likely to respond less favorably to shunting than those without Alzheimer pathology (1 Class III cohort). A single Class II study31 examined whether periventricular hyperintensities were predictive of response. Formal statistics were not given, but Fisher exact test with Bonferroni correction of the result yields p = 0.12. Using modified GRADE methodology, we downgraded this study to Class III because of an inability to detect differences. There is insufficient evidence to determine whether the detection of periventricular hyperintensities on imaging is predictive of shunt response in patients with suspected iNPH (1 Class II study downgraded for lack of precision). There is insufficient evidence to determine whether patients with suspected iNPH and persistent ventricular stasis on radioisotope cisternography would respond to shunting (Class IV evidence only). Because criteria for therapeutic questions are more restrictive than those used to assess prognostic issues, none of the studies cited in the therapeutic section provided high-level evidence of shunt efficacy. That said, it is worth noting (figure 1) that in other studies, more than 80% of patients shunted on the basis of results from TTs,31 ELD,23 and CSF-ITs18,19 improved, just as in a cited therapeutic Class III study.5 Likewise, in studies of other diagnostic modalities26,27,30 in which patients were prescreened with TTs or CSF-ITs, overall response rate among all these patients (ignoring the results of the test under assessment) was approximately 80%. Summary of findings of included studies assessing different diagnostic testing modalities: external lumbar drainage (ELD; column 123), tap test (TT; column 231), CSF pulsatility (column 316), CSF infusion tests measuring CSF flow resistance (Ro; columns 4,18 5,19 and 620), aqueductal flow on MRI as measured by flow velocity (Hyper velo; column 726), aqueductal stroke volume (Aq SV; column 828), aqueductal hypervelocity (Aq vel; column 9,27 defined as ≥25.5), improvement after TT (column 1017), and Ro <12 on infusion test (column 1117). Each bar reflects the overall percentage of patients in that study judged to have improved after shunting. The horizontal dashed line represents the overall response rate among all studies. In all studies, all patients met clinical and brain imaging criteria for the diagnosis of idiopathic normal pressure hydrocephalus. In columns 1,23 2,31 3,16 4,18 5,19 7,26 10,17 and 11,17 patients were selected solely on the basis of these criteria. In columns 6,20 8,28 and 9,27 patients were additionally required to have a positive TT or CSF infusion test in order to undergo shunting. In the latter studies, substantial numbers of patients in whom the add-on investigational test was negative also responded to shunting. Hence, this figure shows the percentage responding among both test+ and test− individuals. Comparing the prognostic impact of various techniques in the cited studies (figure 2) suggests that TTs, among the most widely used screening techniques, add little to sensitivity or specificity. However, this may be misleading because TTs and infusion tests were used to preselect patients for shunting both in the cited study31 and in many of the assessments of other modalities. As demonstrated in figure 2, TTs, ELD, and perhaps CSF pulsatility in response to arterial pressure appear to have high sensitivity with variable but incomplete specificity. Ro, measured in CSF-ITs in patients selected on the basis of only clinical and neuroimaging criteria, appears to add both sensitivity and specificity but still produces many false-negative results. Measuring aqueductal flow by MRI in patients preselected by TTs or infusion tests may provide some incremental improvement in sensitivity and specificity. Measure of relative sensitivity and specificity of the different techniques described; studies are as listed in figure 1. Increased CSF pressure elevations in response to arterial pulsations16 are labeled CSF puls hyper. Results from studies in columns 4,18 5,19 6,20 and 1117 of figure 1 were combined to provide a pooled assessment of Ro. Results from studies in columns 7,26 8,28 and 927 were combined to provide a pooled assessment of elevated CSF flow by MRI. Results from studies in columns 231 and 1017 were combined to provide a pooled assessment of the CSF tap test. ELD = external lumbar drainage. Assessment of comorbidities can enhance predictions of shunt responsiveness; however, the negative predictive value is limited, suggesting that these factors should be included among the considerations in decisions about shunting but should not be an absolute exclusion. Finally, although the presence of Alzheimer pathology unsurprisingly predicts a poor response to shunting, the morbidity associated with performing a brain biopsy before shunting would seem to outweigh the potential benefit. 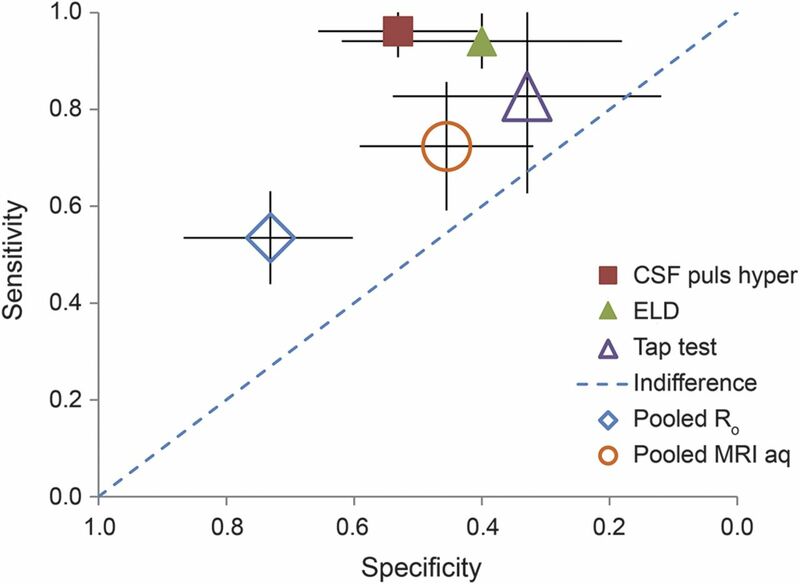 However, it will be worthwhile to study whether use of newer amyloid imaging techniques or measurement of CSF markers can serve as a useful surrogate. Clinicians may choose to offer shunting as a treatment for patients with iNPH in order to treat their subjective symptoms of iNPH and gait (Level C). Because there is a risk of significant AEs, the risks and benefits of the procedure should be carefully weighed (Level B). Clinicians should inform patients with iNPH with elevated Ro that they have an increased chance of responding to shunting compared with those without such elevation (Level B). Clinicians may counsel patients with iNPH that an abnormal CSF-IT or a positive response to repeated LPs increases the chance of response to shunting (Level C). Clinicians may counsel patients with iNPH and their families that increasing age does not necessarily decrease the chance of a shunt being successful (Level C). Clinicians may counsel patients with suspected iNPH and with impaired CBF reactivity to acetazolamide, measured by SPECT, that they are possibly more likely to respond to shunting (Level C). The 3 identified studies with higher than Class IV evidence suggest a benefit of ventricular shunting for iNPH, but there is a decrease of response after 6 months,5 and fewer than half of patients were considered to be improved in all presenting iNPH symptoms after 18 months.e3 Although the vast majority of other published studies has reported clinical improvement of iNPH after ventricular shunting, none to date has been designed to provide high-level evidence of efficacy. It should be recognized that the use of ventricular shunting for iNPH is based largely on uncontrolled observational studies of clinical response. If there is evidence of efficacy, are there clinical or laboratory predictors of a successful outcome? Clinicians have long recognized that at least some patients diagnosed with iNPH do not respond to ventricular shunting, leading to the publication of a large number of studies seeking to identify clinical or laboratory predictors of response. Our review identified only a small number of articles designed to provide high-level evidence in support of studied predictors. Differentiating between the effects of iNPH and AD is important but can be difficult. AD has been reported to coexist in patients with suspected iNPH.e4 It is not surprising that the identification of Alzheimer pathology at the time of shunting would predict a poor outcome. There is evidence that improvement in gait following ELD,22 MRI-measured high CSF velocity through the aqueduct,26 and abnormal intracranial CSF hydrodynamics21 may predict a good response to shunting. It should be noted, however, that there have been publications of a lower evidence class indicating that these measures are not predictive.25,e5−e7 These procedures are associated with significant cost and potential complications,40 and, in the case of CSF-ITs, the equipment required is not widely available (particularly in the United States). A final determination of the value of predictors will depend on the establishment of shunting efficacy in well-designed clinical trials. The question of the efficacy of ventricular shunting for iNPH is important, particularly because some recent reports describe disappointing response rates, failure to achieve long-lasting response, and substantial risks associated with shunting.4,5 Well-designed clinical trials of ventricular shunting in patients with iNPH are clearly needed, including a control intervention, randomized assignment, treatment masking, more objective outcome measures, and a sufficiently long observation period to document the duration of any benefit. Stratification of patients on the basis of possible AD using advanced neuroimaging or CSF markers may provide additional insights, as may consideration of other comorbidities and functional status. The questions of diagnostic accuracy, prediction of response, and treatment efficacy are intertwined. It was estimated that 8,340 patients with iNPH underwent shunting in the United States from 2003 to 2009.e8 Because this procedure is frequently performed in countries such as the United States and newer types of shunts are more expensive, it is important to know whether shunting is effective. Properly performed studies of diagnosis, predictors, and treatment are essential. John J. Halperin: study concept and design, acquisition of data, analysis or interpretation of data, drafting/revising the manuscript, critical revision of the manuscript for important intellectual content, study supervision. Roger Kurlan: study concept and design, acquisition of data, analysis or interpretation of data, drafting/revising the manuscript, critical revision of the manuscript for important intellectual content. Jason M. Schwalb: study concept and design, acquisition of data, analysis or interpretation of data, drafting/revising the manuscript. Michael D. Cusimano: study concept and design, acquisition of data, analysis or interpretation of data, drafting/revising the manuscript. Gary Gronseth: study concept and design, acquisition of data, analysis or interpretation of data, drafting/revising the manuscript, critical revision of the manuscript for important intellectual content. David Gloss: analysis or interpretation of data, drafting/revising the manuscript, critical revision of the manuscript for important intellectual content. This guideline was developed with financial support from the American Academy of Neurology. Authors who serve as AAN subcommittee members or methodologists (J.J.H., G.G., D.G.) were reimbursed by the AAN for expenses related to travel to subcommittee meetings where drafts of manuscripts were reviewed. J. Halperin serves on the editorial boards of The Neurologist and ACP Smart Medicine; serves on the Neurology journal Level of Evidence Review Team; has received honoraria for continuing medical education lectures; has received research support from the Centers for Disease Control and Prevention; and has given expert testimony and acted as witness or consultant regarding the defense of several physicians in medical malpractice cases. R. Kurlan serves as a supplement editor for Neurology; serves on the editorial board of Tremor and Other Hyperkinetic Movements; serves on the speakers bureau of Teva Pharmaceuticals; receives research support from the NIH, Kyowa, AstraZeneca, Rhythm, and Phytopharm; and served as a consultant on a medical malpractice case related to alleged missed diagnosis of normal pressure hydrocephalus (NPH). J. Schwalb serves on the Michigan Parkinson Foundation Physician and Epilepsy Foundation Physician Advisory Board; is a member of the American Association of Neurological Surgeons Subspecialty MOC Educational Materials and the Congress Quarterly editorial boards; has received honoraria from Medtronic; performs shunt placements for NPH; and has received research support from the NIH and internal grants from the Henry Ford Health System Neuroscience Institute. M. Cusimano reports no disclosures relevant to the manuscript. G. Gronseth serves as an evidence-based medicine methodologist for the AAN and serves on the Neurology Level of Evidence editorial board. D. Gloss serves as an evidence-based medicine methodologist for the AAN and serves on the Neurology Level of Evidence editorial board. Go to Neurology.org for full disclosures. Clinical practice guidelines, practice advisories, systematic reviews, and other guidance published by the American Academy of Neurology (AAN) and its affiliates are assessments of current scientific and clinical information provided as an educational service. The information (1) should not be considered inclusive of all proper treatments, methods of care, or as a statement of the standard of care; (2) is not continually updated and may not reflect the most recent evidence (new evidence may emerge between the time information is developed and when it is published or read); (3) addresses only the question(s) specifically identified; (4) does not mandate any particular course of medical care; and (5) is not intended to substitute for the independent professional judgment of the treating provider, as the information does not account for individual variation among patients. In all cases, the selected course of action should be considered by the treating provider in the context of treating the individual patient. Use of the information is voluntary. The AAN provides this information on an “as is” basis and makes no warranty, expressed or implied, regarding the information. The AAN specifically disclaims any warranties of merchantability or fitness for a particular use or purpose. The AAN assumes no responsibility for any injury or damage to persons or property arising out of or related to any use of this information or for any errors or omissions.
. The special clinical problem of symptomatic hydrocephalus with normal cerebrospinal fluid pressure: observations on cerebrospinal fluid hydrodynamics. J Neurol Sci 1965;2:307–327.
. Prevalence of probable idiopathic normal pressure hydrocephalus in a Norwegian population. Acta Neurol Scand 2008;118:48–53.
. Clinical guidelines for idiopathic normal pressure hydrocephalus. Neurol Med Chir 2004;44:222–223.
. Idiopathic normal pressure hydrocephalus: a systematic review of diagnosis and outcome. Neurosurgery 2001;49:1166–1184; discussion 1184−1186.
. Long-term outcome in patients with suspected normal pressure hydrocephalus. Neurosurgery 2007;60:327–332; discussion 332. American Academy of Neurology. Clinical Practice Guidelines Process Manual, 2004 ed. [online]. Available at: https://www.aan.com/Guidelines/Home/UnderDevelopment. Accessed November 1, 2014. American Academy of Neurology. Clinical Practice Guidelines Process Manual, 2011 ed. [online]. Available at: https://www.aan.com/Guidelines/Home/Development. Accessed November 1, 2011.
. GRADE guidelines: a new series of articles in the Journal of Clinical Epidemiology. J Clin Epidemiol 2011;64:380–382.
. A prospective study of ventriculo-peritoneal shunting for idiopathic normal pressure hydrocephalus. J Clin Neurosci 2009;16:1180–1183.
. The Clinician Interview-Based Impression (CIBI): a clinician's global change rating scale in Alzheimer's disease. Neurology 1994;44:2315–2321. ; SINPHONI-2 Investigators. Lumboperitoneal shunt surgery for idiopathic normal pressure hydrocephalus (SINPHONI-2): an open-label randomised trial. Lancet Neurol 2015;14:585–594.
. Guidelines for management of idiopathic normal pressure hydrocephalus. Neurol Med Chir 2008;48(suppl):S1–S23.
. Diagnosing idiopathic normal-pressure hydrocephalus. Neurosurgery 2005;57:S4–S16; discussion ii–v.
. Objective B wave analysis in 55 patients with non-communicating and communicating hydrocephalus. J Neurol Neurosurg Psychiatry 2005;76:965–970.
. Cerebrospinal fluid drainage and dynamics in the diagnosis of normal pressure hydrocephalus. Neurosurgery 2009;64:919–925; discussion 925−926.
. Intracranial pressure parameters in idiopathic normal pressure hydrocephalus patients with or without improvement of cognitive function after shunt treatment. Dement Geriatr Cogn Disord 2007;23:47–54. ; European iNPH Multicentre Study Group. 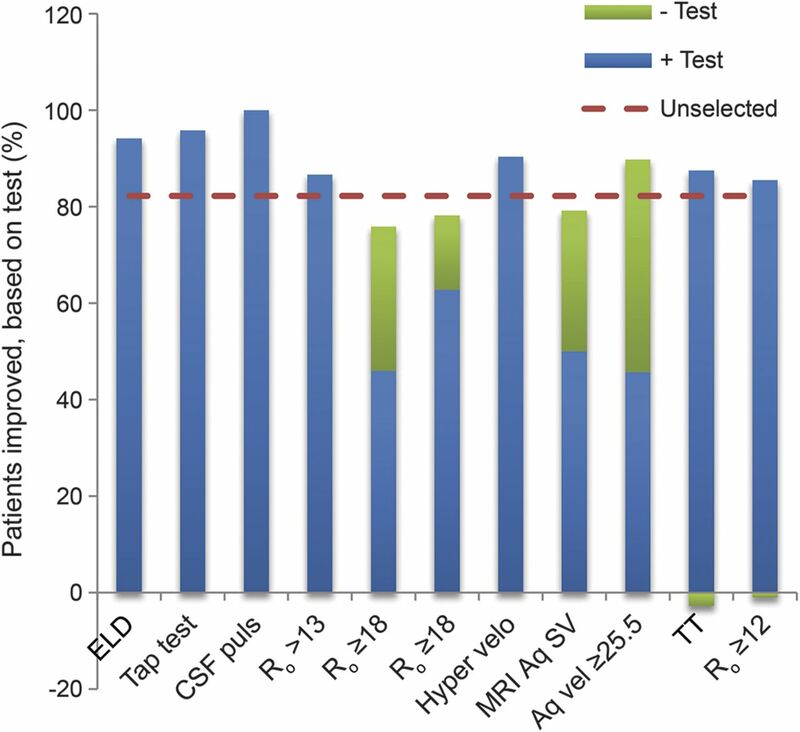 The European iNPH Multicentre Study on the predictive values of resistance to CSF outflow and the CSF tap test in patients with idiopathic normal pressure hydrocephalus. J Neurol Neurosurg Psychiatry 2013;84:562–568.
. A prospective study on the clinical effect of surgical treatment of normal pressure hydrocephalus: the value of hydrodynamic evaluation. Br J Neurosurg 2004;18:149–157.
. The Dutch normal-pressure hydrocephalus study. How to select patients for shunting? An analysis of four diagnostic criteria. Surg Neurol 2000;53:201–207.
. Lumbar infusion test in normal pressure hydrocephalus. Acta Neurol Scand 2005;111:379–384.
. Outcome predictors for normal-pressure hydrocephalus. Acta Neurochir Suppl 2006;96:364–367.
. Diagnosis and management of idiopathic normal-pressure hydrocephalus: a prospective study in 151 patients. J Neurosurg 2005;102:987–997.
. The predictive value of external continuous lumbar drainage, with cerebrospinal fluid outflow controlled by medium pressure valve, in normal pressure hydrocephalus. Acta Neurochir 2005;147:953–958; discussion 958.
. A prospective study of cerebral blood flow and cerebrovascular reactivity to acetazolamide in 162 patients with idiopathic normal-pressure hydrocephalus. J Neurosurg 2009;111:610–617.
. Use of cerebrospinal fluid flow rates measured by phase-contrast MR to predict outcome of ventriculoperitoneal shunting for idiopathic normal-pressure hydrocephalus. Mayo Clin Proc 2002;77:509–514.
. Agreement between CSF flow dynamics in MRI and ICP monitoring in the diagnosis of normal pressure hydrocephalus: sensitivity and specificity of CSF dynamics to predict outcome. Acta Neurochir Suppl 2002;81:7–10.
. The role of cerebrospinal fluid flow study using phase contrast MR imaging in diagnosing idiopathic normal pressure hydrocephalus. Acta Neurochir Suppl 2008;102:119–123.
. Is aqueductal stroke volume, measured with cine phase-contrast magnetic resonance imaging scans useful in predicting outcome of shunt surgery in suspected normal pressure hydrocephalus? Neurosurgery 2007;60:124–129; discussion 129−130.
. Phosphorylated tau/amyloid beta 1-42 ratio in ventricular cerebrospinal fluid reflects outcome in idiopathic normal pressure hydrocephalus. Fluids Barriers CNS 2012;9:7.
. Lack of shunt response in suspected idiopathic normal pressure hydrocephalus with Alzheimer disease pathology. Ann Neurol 2010;68:535–540.
. Predicting the outcome of shunt surgery in normal pressure hydrocephalus. J Clin Neurosci 2007;14:729–736.
. Adjustable valves in normal-pressure hydrocephalus: a retrospective study of 218 patients. Neurosurgery 2002;51:1392–1400; discussion 1400−1402.
. Seven years of clinical experience with the programmable Codman Hakim valve: a retrospective study of 583 patients. J Neurosurg 2000;92:941–948.
. Clinical experience with a new pressure-adjustable shunt valve. Acta Neurochir 1995;134:119–124.
. Five-year outcome of normal pressure hydrocephalus with or without a shunt: predictive value of the clinical signs, neuropsychological evaluation and infusion test. Acta Neurochir 2002;144:515–523; discussion 523.
. Three-year survival and functional outcome of patients with idiopathic adult hydrocephalus syndrome. Neurology 2000;55:576–578.
. Prospective analysis by computed tomography and long-term outcome of 23 adult patients with chronic idiopathic hydrocephalus. Neurosurgery 1996;38:51–59.
. Outcome of shunting in idiopathic normal-pressure hydrocephalus and the value of outcome assessment in shunted patients. Neurosurgery 2005;57:S40–S52; discussion ii–v.
. Guidelines for management of idiopathic normal pressure hydrocephalus: progress to date. Acta Neurochir Suppl 2005;95:237–240.
. Infectious complications of temporary spinal catheter insertion for diagnosis of adult hydrocephalus and idiopathic intracranial hypertension. Neurosurgery 2008;62:431–435; discussion 435−436.